My three daughters grew up in fairly typical sisterly fashion, that is there was a time when they could barely stand to be in the same house together, let alone the same room. This photo of two of them does my heart good and makes me proud. My father would often ask me if I had talked to my sister recently; he didn’t want us to lose each other – and we haven’t – she and her husband are our travel buddies. But as my girls grew and spread across the country I heard my father’s words coming out of my own mouth. I am so pleased that the three of them talk regularly and look forward to seeing each other and even plan vacation time to make it happen. 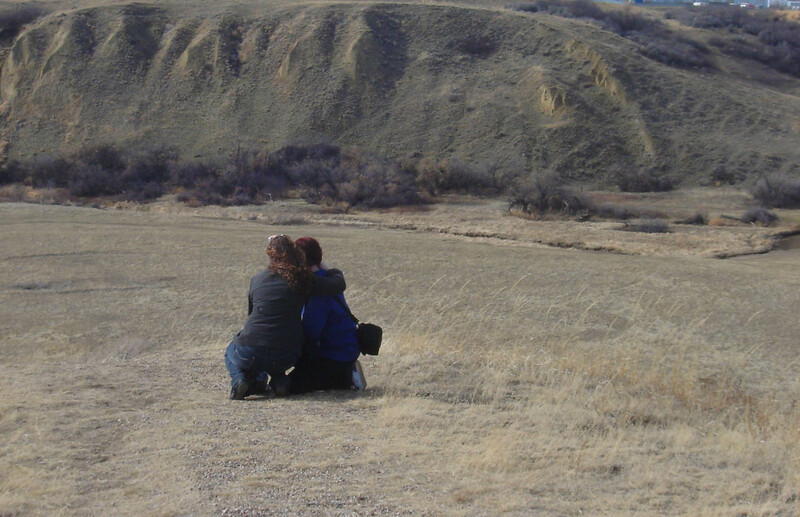 This photo was taken looking at one of the coulees in Medicine Hat in Alberta. If I recall mum this was at the same time that we were trying to take a picture and you were in our frame . . .
Sweet, Lynne. My sister is my best friend, and next to health and happiness, that is what I wanted for my two kids. Thank goodness, they are best friends too. It is gratifying, and comforting I think. And thank you for the cockatoo lesson! Nothing can be more beautiful than a very close family that loves each other. A family that is a pillar and strength for each other. I see this happening with the sisters and I am so grateful. It’s very comforting to know that they will always have each other. That’s very sweet. I hope my kids will be close with eachother as they grow up. We tell them all the time that they’re not only brother and sister, but friends, and they need to treat eachother kindly. So far so good, three years down, a lifetime to go. My Dad didn’t stay that close with his siblings, especially his sisters and I think it was a correction he wanted to make for us, and he did. I have three girls too. I wish I could show you a recent photo of two of them at an outdoor concert. It is exactly like the one you posted. The two girls in question HATED each other in high school. Now, they live together in Vail, CO and LOVE every minute together. Did I do something right?